It is one of the most important destinations in the whole wide international tourist circuit because it is a unique, marvellous city that no one should miss. 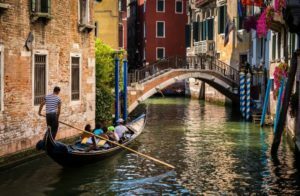 Venice was erected on 117 small islands, connected by countless bridges and passages and it is comparable to an enormous traffic island. Two hours’ walk are required to move to St. Mark (San Marco) Square from the railroad station, unless you lose your way: nevertheless this is a “risk” to be run. It is one of the most important cities of the Roman Empire. 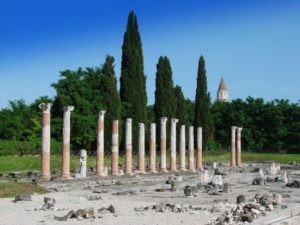 Aquileia was founded in the year 181 B.C. and became an outstanding trading port besides an important center of radiation of the Christianity. This ancient roman metropolis was certified as historical and archaeological heritage of mankind by UNESCO and several evidences of its splendour can be admired still today. 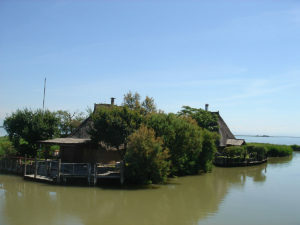 Marano is an ancient stronghold on the so-called Marano lagoon recalling its past status of bulwark – ruled by the Serenissima Republic of Venice since 1534 – in the land of Friuli. It still keeps an unbroken atmosphere of an old fisherman town, with the ancient buildings facing the seaport and the fish-market. The 15th century patriarchal tower still stands in the central square showing the heraldic bearings of the Venetian Governors, whose loggia and palace are not so far away. 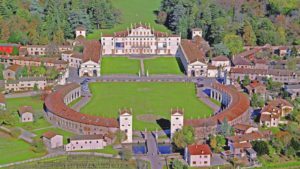 Palmanova is a nine-point star-shaped fortress erected at the end of the 16th century by the Venetians to face the dreadful Turkish invasions and to check the hegemonic designs of the Austro-Hungarian empire. It is an inexpugnable stronghold, whose perfection lies in its perfect architectural symmetry and war efficiency. The project arose from an idea conceived by Giulio Savorgnan, a captain and military engineer of the Republic of Venice. The city wall perimeter is a 18-side polygon divided into nine ramparts. Bonaparte furtherly increased the fortifications and renamed the city Palma la Nuova (Palma the New). Three gates, probably designed by Vincenzo Scamozzi, give access to the city: Aquileia gate (formerly Marittima gate), Udine gate and Cividale gate. 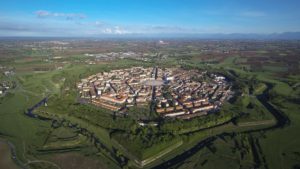 A main step to gain a good knowledge of the history of the city is a visit to the Civico Museo Storico (Civic Historical Museum) where documents about the history of the fortress and a collection of weapons (16th to 20th century) are shown. Another outstanding museum is the Historic Military Museum where documents, relics, collections of weapons and a complete general wiew on the garrisons on duty in Palmanova are exposed. Lodovico Manin was the last Doge of the Venetian Republic and his family came from the land of Friuli. In this land the Manin family erected this immense villa facing a large hemicycle-shaped square surrounded by a long colonnade. After the fall of the Venetian Republic, the villa worked as Bonaparte’s headquarters and in this residence the Treaty of Campoformido was prepared to make over the possession of the venetian territories to the Austrian empire. Today, the villa is employed as a seat of cultural exhibitions, while the boundless park at the back is open to the public. In the district of Udine, Cividale del Friuli lies upon the gentle hills covered with vineyards and called “Colli Orientali del Friuli” (Eastern Hills of Friuli), a celebrated area where wine denomination is strictly controlled to preserve origin and quality of the products. These areas are called D.O.C. and reach the big number of eight in the territory of Friuli Venezia Giulia! 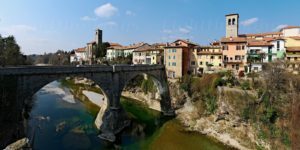 Cividale was born as a roman city (its former name Forum Julii became later the name of the whole region : Friuli) and acquired a relevant importance in the year 568 becoming the seat of the first Longobard Dukedom in Italy besides being the main center of the region. Later on, Cividale was under the Frankish rule (even Charles the Great was here), the Patriarchs of Aquileia, the Venetians, the Hapsburg stock. A visit to the impressive Cathedral Church cannot be missed as well as to the Christian and Archaeological Museums with a final look to the small Longobard temple which is reputed to be a real tiny jewel. 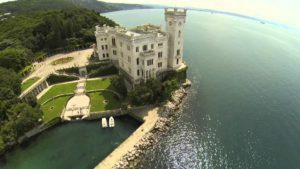 The Castle of Miramare and its park were erected on the karst rocky headland of Grignano, close to Triest, according to the will of Ferdinand Maximilian of Hapsburg (1832-1867), the younger brother of the austrian emperor Francis Joseph. The estate was designed in 1856 by Carl Junker and the outer construction was completed in 1860. Furnishings and inner decorations, by Franz and Julius Hofman, were completed after Maximilian’s departure to Mexico in 1864. After being appointed emperor of Mexico, Maximilian was shot at Queretaro in 1867. Friuli offers you a lot of tours that will lead you to discover charming art treasures, historical ruins, exquisite wines, gastronomical specialties, wildlife parks.We can give you the cue to spend a real special day during your holidays or to make some interesting off-season discoveries …perhaps tasting some savoury slices of raw ham from San Daniele del Friuli on the spot! 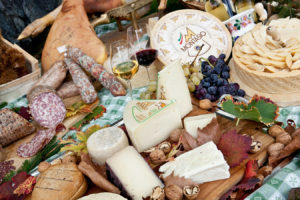 Or sipping one of the regal wines of the Collio, enjoying it directly at the producer’s home, as well as it is recommended to taste what is widely known as the tipical product of the region i.e. the latteria cheese. If you are busy in getting the ancient taste of the Gubana cake within the valleys of the Natisone river at Vogrig’s home.